Real Estate | Park View, D.C. It has been a while since I’ve had the opportunity to pop into an open house … mostly because so much real estate recently changes hands without one. I chanced upon one this past weekend at 731 Princeton Place and, after taking a peek, can report back that the house is move in ready and struck me as reasonably comfortable. The house is listed at $685,000 which seems about right when compared to recent sales of other move-in-ready homes in the area this year. I’ll be surprised if its on the market for long. The full listing, along with photos, is available at online here. 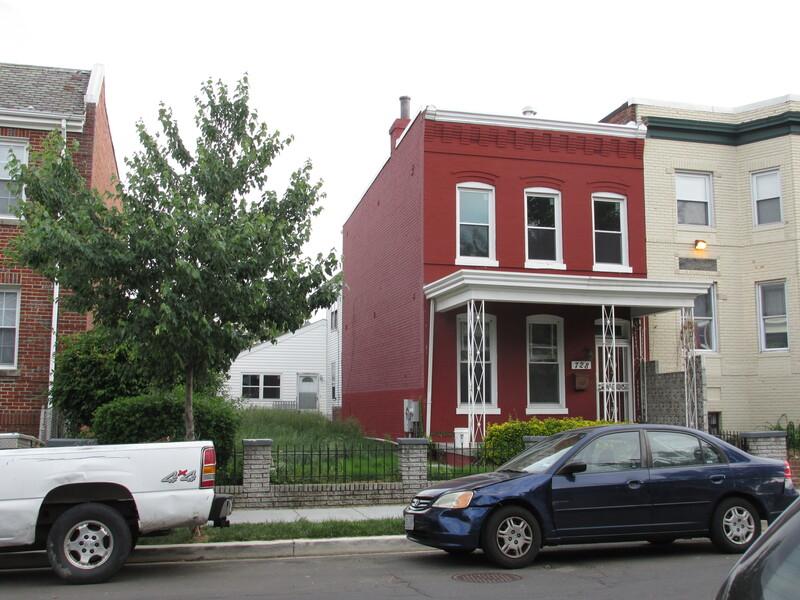 According to Redfin, the single family house at 728 Park Road, NW, sold on May 19th for $1,350,000. In looking at the property, the lot is both deep and wide. While I have not been contacted by the new owner, my educated guess would be that this lot is headed for development as a multi-family dwelling — at least this is what’s happened with two other lots on the 700 b/o Park Road over the last year. You can see a photo of the property below. I’ll provide updates if/when there are available. The rowhouse at 630 Quebec Place was placed back on the market 5 days ago (See listing and photos here). It was last on the market in April 2013 for $349,500 and, based on what was reported to me, was in really rough shape. Less than a year later, the house has been renovated and is back on the market for $849,900. While this isn’t the most expensive house to go on the market in Park View this past year, it is on the upper end of the range. I was hoping to see the house in person over the weekend, but the advertised open house didn’t seem to materialize. Still, I liked what I was able to see in reviewing the listing and photos. 2,578 Sq. Ft. of living space. A 2,134 Sq. Ft. lot. The new condos at 762 Park Road are finished and available for viewing. Having watched the mostly empty lot at 762 Park Road transform from an auto mechanic shop into additional housing for the community has been interesting. I’m happy to announce that the seven condo project is now finished, staged, and ready for viewing. Following is a description, write-up, and details about the project from the realtor, who has also graciously provided the photographs to give readers a sense of what to expect. What do you think? 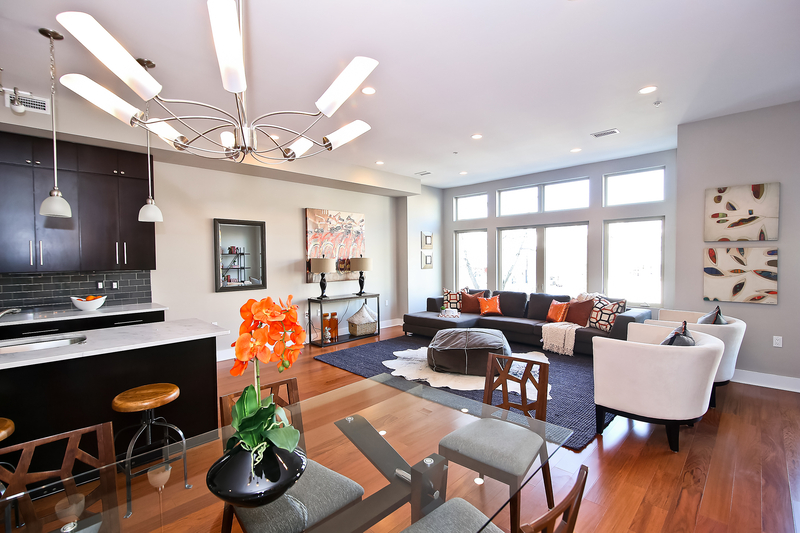 Seven brand-new exclusive condos, including a gorgeous carriage house. The North Star offers seclusion and privacy in a premiere location with panoramic views and outstanding contemporary designs and finishes. Each beautifully constructed unit features an open & expansive layout, two spacious bedrooms & two full luxurious bathrooms, large designer kitchen, sun-filled rooms & elegant modern design throughout. Lavish finishes & impeccable style. Features include soaring ceilings, oversized windows, white Carrera marble counters, wide wood plank floors, custom cabinetry, Grohe faucets, contemporary sink vanities, professionally designed walk-in closets & much more. 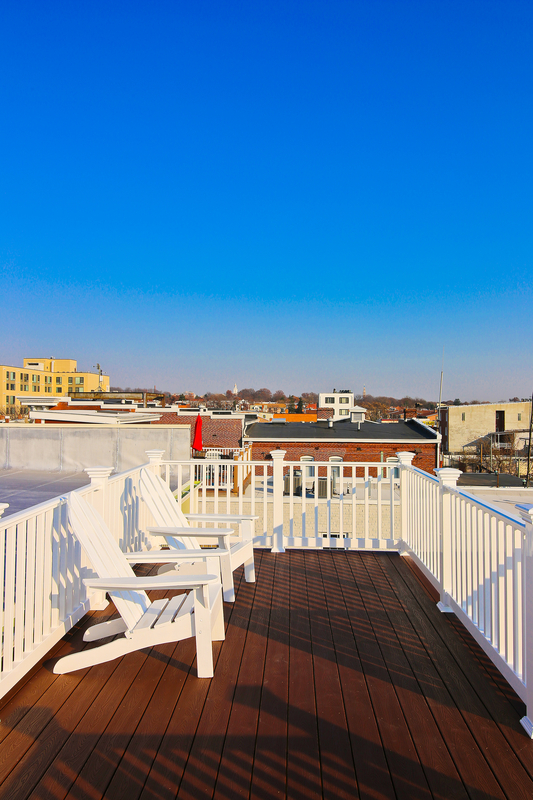 Each unit boasts own private balcony overlooking a beautifully landscaped communal courtyard, while a rooftop terrace provides panoramic views of the Washington Monument & additional entertainment space. Live with activity. 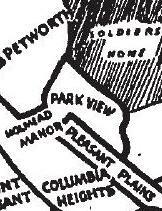 The North Star is located in the Park View/Columbia Heights area. 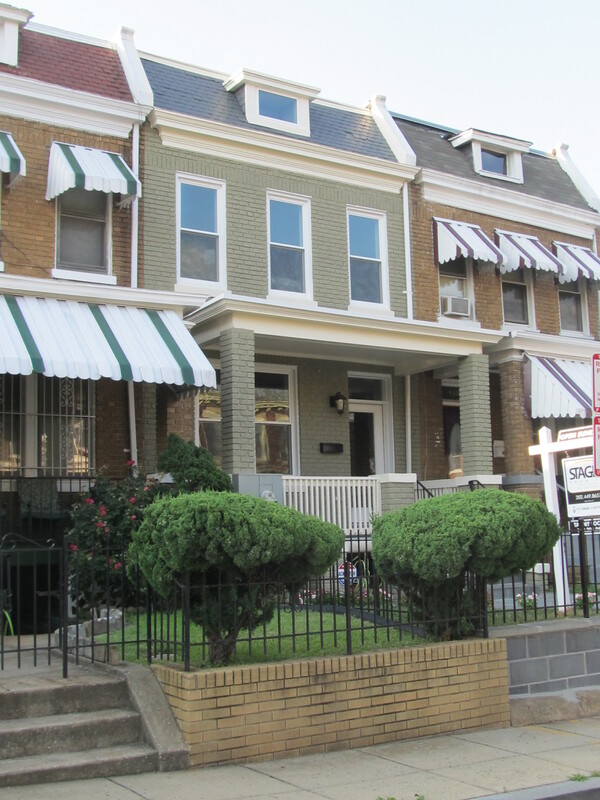 Columbia Heights is one of DC’s most sought after neighborhoods. The building boasts easy access to two metro stations, dozens of great restaurants and bars, plus a 500,000 square foot urban retail center anchored by Giant, Target, Best Buy, Marshalls, Bed Bath & Beyond, DSW & Washington Sports Club. The neighborhood’s urban character, access to public transportation, and proximity to the downtown core, have all sparked new energy and excitement that the neighborhood is ready to share. View east toward the Soldiers’ Home from the roof. S2 Development, LLC, is a residential development company comprised of two brothers – Phil and Lee Simon. 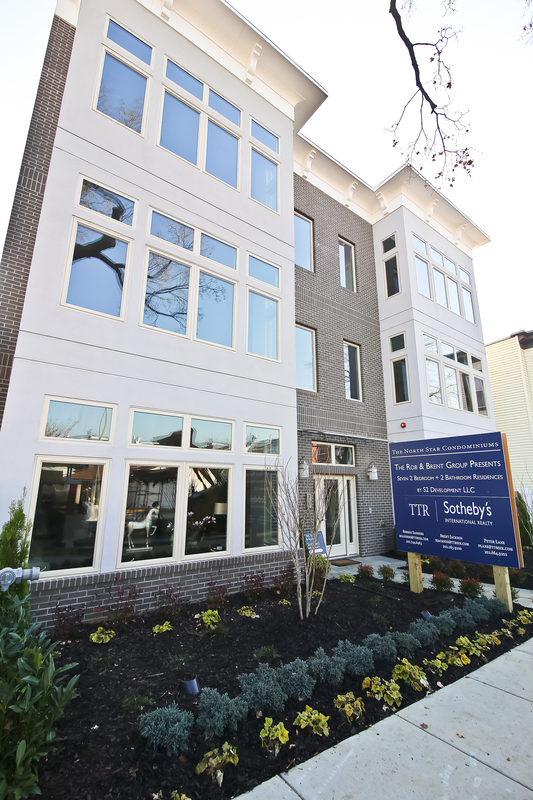 Since being founded in 2009, S2 Development has been highly active in the Washington DC metropolitan area. S2 Development’s goal is to combine creative design with high quality workmanship to deliver lasting value to its customers and the community as a whole. They specialize in the acquisition, renovation, and sale or lease of single family and small multi-family properties. Map showing surplus property shaded in brown. A public meeting has been scheduled for Monday, November 25th, at the Park View Recreation Center (693 Otis Place, NW (corner of Warder)) beginning at 6:30 p.m. to provide community input on the disposition of District property that has been determined to be surplus. The property is listed as Lot 0105 in Square 2892. 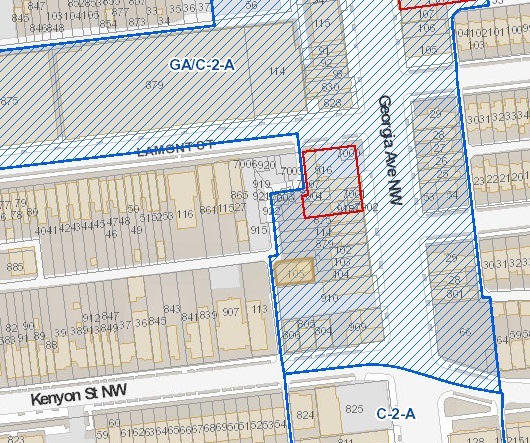 In looking at the DC Zoning map, I see that this parcel is an alley lot with a small structure on it located behind and just to the north of Petworth Liquors. I have no doubt that the property will be incorporated into the Planned Unit Development currently in the works for 3212-3218 Georgia Avenue. Anyone interested in knowing more about the disposition of this parcel should consider coming to the meeting. I’ll post a follow-up for those that find this date or time impossible. The new Park Row Condo development — located on the Park View/Columbia Heights border at 3413-3417 Sherman Avenue (just south of Park Road) — is finally completed and on the market. The row consists of six, 2-level, 2-bedroom and den units. In walking through the open house last weekend, I was pleasantly surprised by what I saw. I can honestly say they exceeded my exceptions. Below is a video that provides a virtual walk-through. One thing I’d been trying to find out since I first learned of the project was how a three-story building could contain two, two-level units. To see how this puzzle fits together, take a look at the floorplans which are online at the GreenLineRe.com Website. Below are the overall details and pricing from the GreenLine Website. 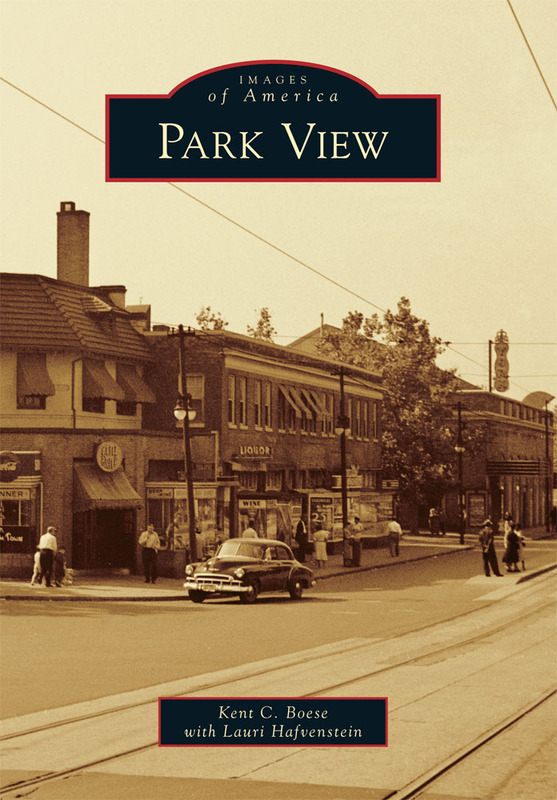 In reviewing area real estate listings, I’ve noticed that listing prices in Park View are continuing to go up. Conceding that a low supply of move-in-ready options is falling short of the flood of new residents to the District, I guess I’ve long since ceased being surprised. But still, there are a few recent listings that have continued to push the envelope of what has been considered the high end of Park View real estate and I wanted to put them out there to see what people think about them. 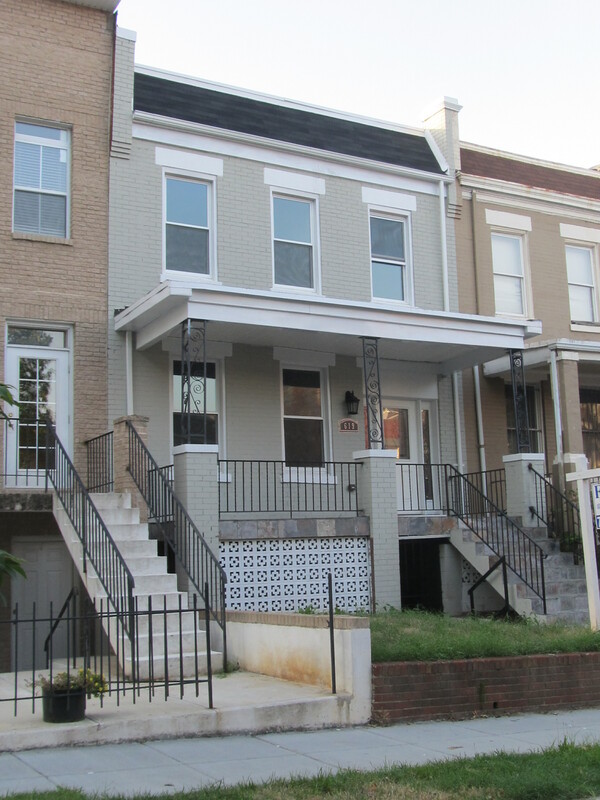 The first is 619 Irving Street, NW, which has been on the market for 13 days. It is listed at $848,900 (see full listing here). According to the listing, this house has 5 bedrooms, 3 ½ baths, and 2,024 sq. ft. of living space which makes the cost of this property $419 per sq. ft. The next is at 421 Newton Place, which came on the market 5 days ago (see listing here). It is listed at $789,900. Like the house on Irving Street, it also has 5 bedrooms and 3 ½ baths. The listing states the house has 2,100 sq. ft. of living space which makes the cost of this property $376 per sq. ft. In walking past the property last night I saw that it will be having an open house this weekend, so I definitely want to check it out. Home is in need of completion. 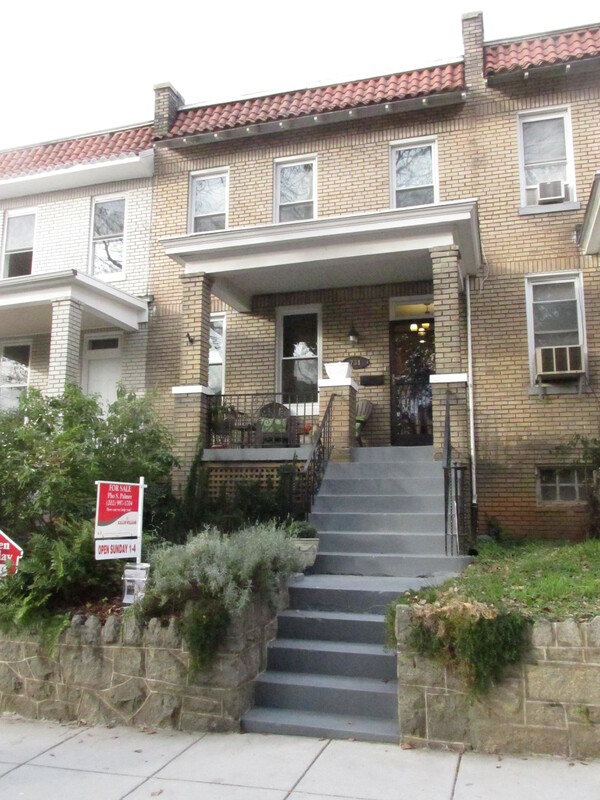 Come see this 5BR 3Ba home in Columbia Heights just minutes to the Petworth Metro. There is New Plumbing, Upgraded Electric, 2 Zoned AC top floor renovation complete. Any materials you may want from the property be sure to include in your offer. ENTER THE HOUSE AT YOUR OWN RISK. Clearly there is value in the new plumbing and electrical … but its impossible to get a true sense of a building in mid-renovations without having walked through it. 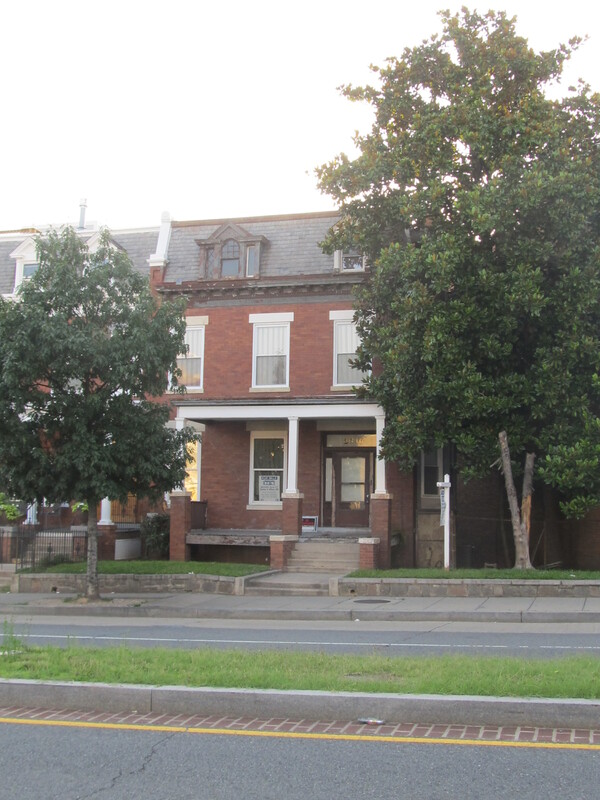 On another note, the property at 3639 New Hampshire Avenue has been on the market for 54 days now. This is somewhat unusual these days and I can only suspect that the $1,200,000 listing price might be a factor.